Anchor - André, do you agree? Do you believe that some kind of pressures existed to extend this investigation, without anything new? Blimey,i thought the police had to investigate without fear or favour,what a corrupt lot they are. This has certainly set an example for similar cases of claimed abduction.Don't bother doing a thorough investigation just believe what the parent's say no questions will be asked. I honestly don't understand it at all. Parents are generally the first suspects but it appears SY won't even consider the (very real) possibility that they are involved. Since when is the word of the prime suspect taken as gospel and the investigation pretty much guided by them?! Thank you, Joana. It is refreshing to get this logical analysis from the point of view of someone who should know; Portuguese and police. You're very welcome Pat, this correlates with your assumptions that you wrote recently in your blog. And leaves more questions than answers. From the whys to the hows. Which on the side of Portugal cannot be merely explained with a pathetic subservience towards the English as a sociocultural factor. Surely the Portuguese will not tolerate this and must do something. I pin all my faith on to Dr Amaral now. The British MUST be shown up for the corrupt bunch of b******s they are. This whitewash is being played out before our eyes, how can that possibly be allowed? So here we have another ex-police Chief Inspector AND an author - this one an academic, a Professor of Law - saying there is clearly an on-going attempt to exonerate the VIPs - nearly wrote VIPERS! Sorry! Freudian slip! This is what we "trolls", have been saying all along and what's more; Scotland Yard is trying, actually denigrating the work of the Portuguese Police, applying pressure on Portuguese court decisions - while simultaneously providing the couple with ammunition against Gonçalo Amaral should the civil case go all the way to the European Court of Human Rights. And unless Britain opts out of the EU, it probably will. I believe that in such case, the target will be the Portuguese nation itself. Unless they have "kept an ace up their sleeves" this should teach the Portuguese authorities not to allow ANY foreigner suspects - guilty of abandoning their children to their fate - to walk out of the country Scot-free. Of course there is! No need to go to SpecsSavers to see that! Thanks Joana, for keeping us informed about how people of common sense in y'r country relate to the "work" of the Scotland Yard. 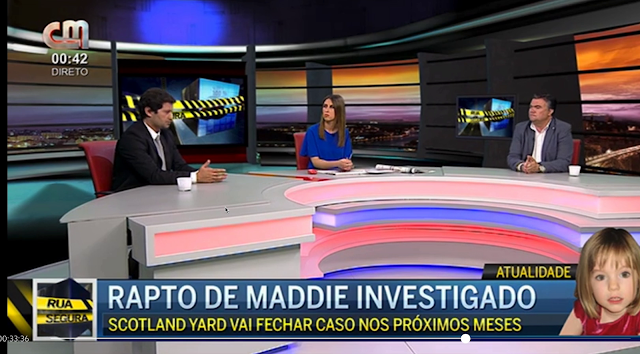 British MSM does not write much about how this case is discussed in Portugal, as we all know.In my country (Sweden) Madeleine seems to be completely forgotten and it makes me sad.